Yesterday I visited a small and cramped Starbucks in a neighborhood full of spacious apartments, and today I’m at a considerably sized Starbucks in a neighborhood of unbelievably small apartments. What a conundrum! I guess that just goes to show you can’t depend on the neighborhood stereotypes for everything. 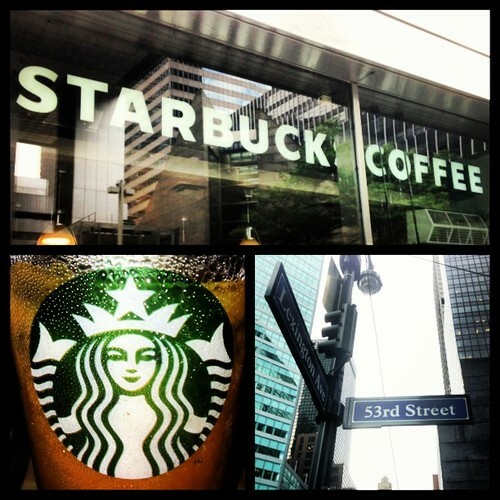 The Starbucks on 43rd and 3rd really did surprise me with its grand size and moderate crowd. From what I’ve discovered, the handful of big Midtown Starbucks are strategically placed to impress travels and tourists — Times Square, Herald Square, etc… But this Starbucks is just hidden enough for the patrons to be residential and still be located near Grand Central Terminal. If I lived in the neighborhood this would definitely be my “Go-To Starbucks.” In fact, anyone living in Midtown will probably have more office space here than in their own apartments. Rarely do I find a Midtown Starbucks that I feel comfortable enough to want to sit and stay awhile. They are either too small, too crowded, lacking seats or riddled with tourists. 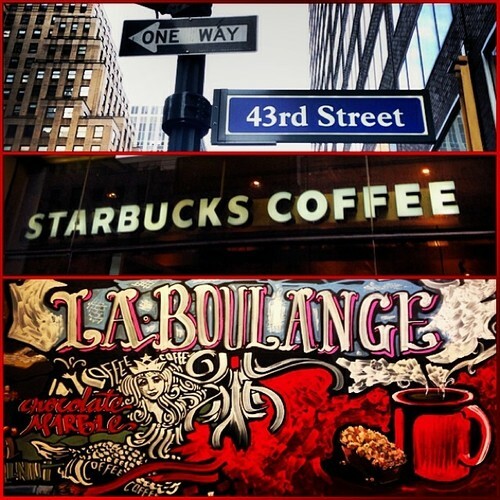 So when I do find one — like the Starbucks on 53rd and Lexington — I tend to pay special attention and cherish the moment. In this particular case, I’m certainly not the only one who finds this Starbucks to be a good office away from the office. Virtually everyone sitting here has a laptop out. Some are even on what I presume to be conference calls. And of the people sitting in either of this Starbucks’ two seating areas, I’d say half are actually paying customers and half are simply in it for the Internet and office space. It’s this type of behavior that has lead to several of the NYC Starbucks covering up their power outlets. This location’s outlets are free and plentiful — hence the crowd. It almost justifies the outlet covers, but I still feel that simple management and crowd control is a better alternative. Today I did something unprecedented. I attended class on a Saturday morning. Not only does it start at 9am, but it lasts for six hours. You may think my the next few months are looking pretty grim, but alas I’m confident I will survive. We even had a lengthy discussion about Starbucks today. The class is a PR Writing course, and we spent nearly 30 minutes critiquing Starbucks’ most recent press release announcing the return of the Pumpkin Spice Latte. 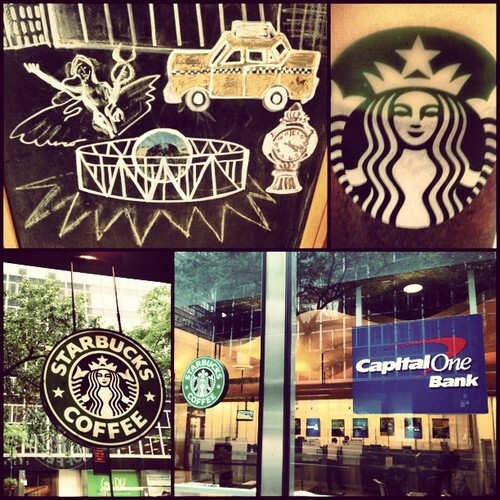 Although most of the discussion was aimed toward whether the release was affective or not, we also discussed the cultural significance of Starbucks, its ability to signify the beginning of fall and just how many people care about the return of the PSL. Obviously, I came to Starbucks defense. After all, it was my Venti Iced Coffee that enabled me to stay awake in class this morning. 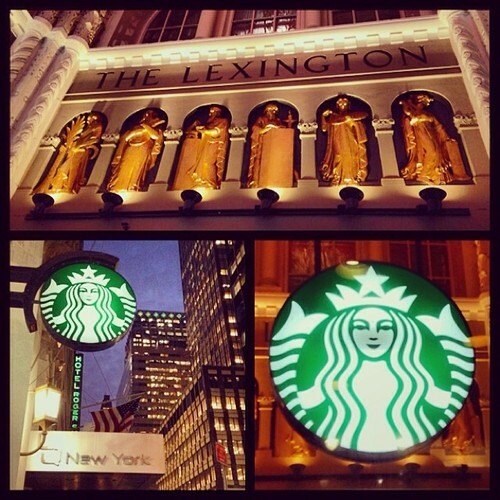 Now, I sit in the Starbucks on the corner of 44th and Lexington Avenue. From its exterior, I had high hopes for this Starbucks. It’s got a great deal of window space. It’s connected to the gigantic US Post Office. And I could see empty seats through the windows — always a good sign. 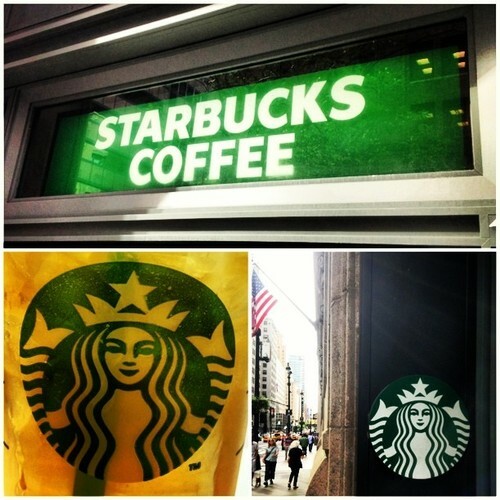 Unfortunately, the facade turned out to be a mirage, and this Starbucks is as shallow as a Hell’s Kitchen gay bar. Literally, the barista bar is a mere 5 ft from the front entrance. It expends a good length on either side, but if a line were to form, there’d be a whole lot of bumped shoulders and ‘excuse me’s just to get to the milk and sugar bar. Thankfully, the crowd is light today. 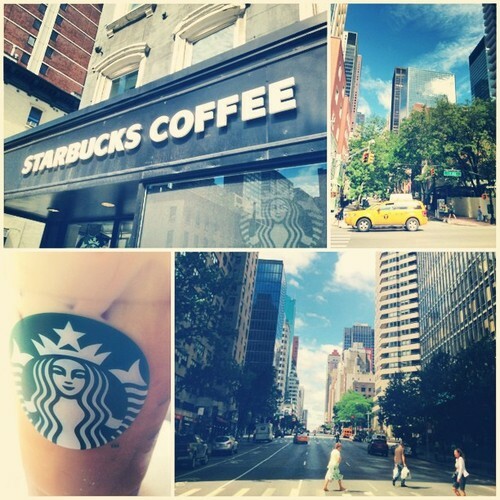 But I’m sure this Starbucks takes a beating during the week due to its proximity to Grand Central Terminal. With no power outlets and no public restroom, perhaps this Starbucks would be better served as a sidewalk concession stand — a NYC drive-through, if you will. No lobby. Simply walk up to the window, place your order, step forward, receive your order, continue down Lexington Avenue. Done deal. New York City has been undergoing a heat wave this week. Basically, this city has been transformed into a concrete oven that heats to 97 degrees and seems to stay that way ALL day. So these Starbucks Treat Receipts couldn’t come at a better time. The Starbucks on 48th and 3rd avenue is a tiny rectangle with a small barista bar, a row of chairs against the front window. and one long cushioned bench with tables. The neighborhood of Turtle Bay is kind of off the beaten path (unless your heading to a train), so this Starbucks seems to only attract passersby, making the tiny seating area more than enough to hold the crowd. Despite the fact that it’s small, closes earlier than most and doesn’t appear to have any power outlets, this Starbucks is still a welcoming reprieve from this NYC heat. I’m sticking to the east side of Manhattan for the moment. And today I discovered a new neighborhood: Turtle Bay. Turtle Bay spans Midtown-East from 43rd to 53rd street. It encompasses the UN Headquarters, and from what I observed, a lot of nail salons, obscure restaurants and grocers. I look up and I see much more apartment complexes than office buildings. And there’s a good amount more greenery here as well. 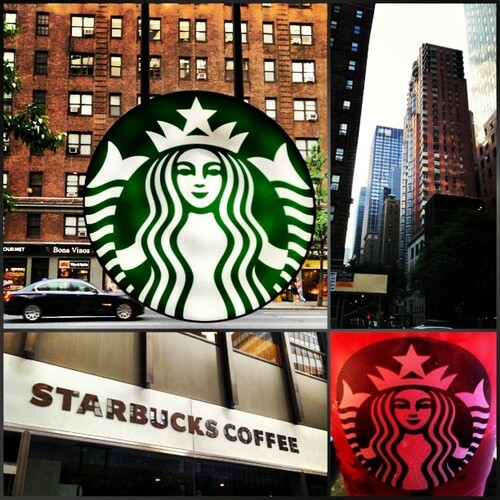 The Starbucks on 50th & 2nd has a cute (and clean) exterior. In fact, the whole location is much cleaner than most Manhattan Starbucks. The crimson red sofa looks like new and the wooden bars shine (how exactly is wood shining?). Unfortunately, cleanliness doesn’t help the fact that it’s a teeny-tiny location. There’s maybe 15 seats in the whole place. And a lot of them are directly across from the bar where the line builds up. I’ve come to expect Midtown locations to be pint-sized. But usually when they are pushed so far east into the residential areas (as this one is) I tend to expect a little more room.